Retidyne™ is a new lutein-based dye for internal limiting membrane staining. It uses the intrinsic staining characteristics of lutein which is already known to act as an antioxidant and blue-light filter in the human retina. 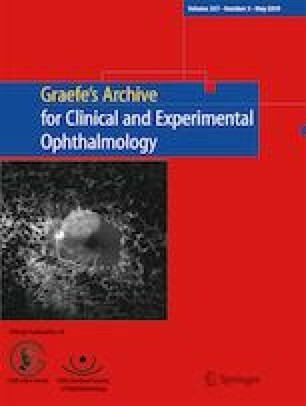 We investigated retinal tolerance to different staining times measured by the electroretinogram (ERG) of an isolated and perfused retina whole mount. For functionality, testing bovine retinas were prepared and perfused with an oxygen saturated standard solution and the ERG was recorded until stable b-wave amplitudes were reached. Then the perfusion was stopped and Retidyne™ was applied directly onto the retinal surface for exposure times of 60 or 120 s. After restarting the perfusion with standard solution, the ERG amplitudes were monitored for 75 min. To investigate the effects on photoreceptor function alone, 1 mM asparate was added to block b-waves. For an exposure time of 60 s amplitudes of a- and b-waves remained stable throughout the experiment. Exposure times of 120 s caused an initial drop of amplitudes that reached statistical significance only for a-waves (a, − 21%, p = 0.047; b, − 14%, p = 0.052). This effect was only seen during the first minutes of the washout and the ERG recovered completely. In the model of isolated and perfused bovine retina, Retidyne™ showed a good safety profile for common intraoperatively used staining times. An initial toxic effect regarding the transient drop of amplitudes cannot be ruled out but the effect might also be explained by the partial blockage of the flashlight due to a more intense staining effect at the beginning of the washout.